Mercury Adhesives is proud to have supported Boy Scout Troop 69’s Inaugural Drone Race. Be sure to check it out, and hit like! Joshua Bardwell, known as the Drone Racing Engineer on Facebook, has an awesome YouTube channel where he posts instructional videos and reviews on all things related to multi rotor drones. 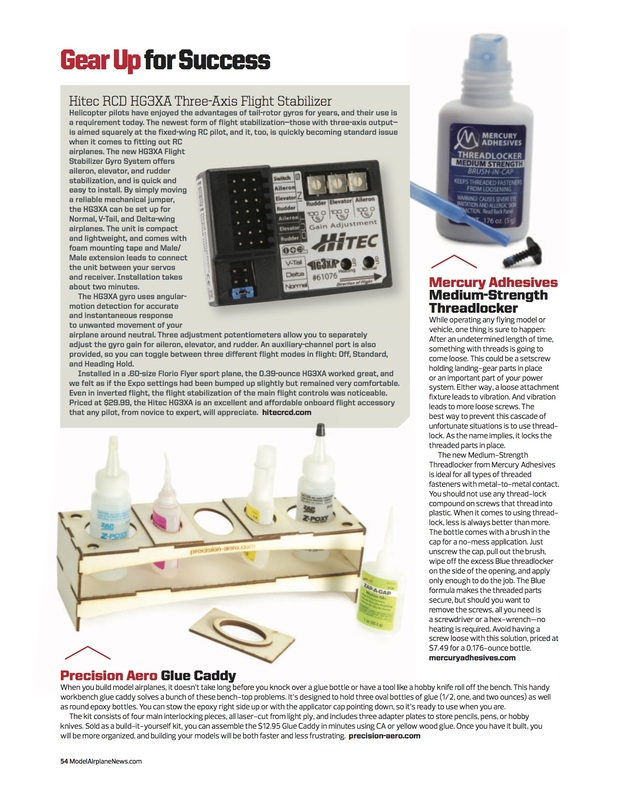 Electric Flight, March 2016 issue, reviewed our new Brush-in-Cap Threadlocker and gave us a glowing recommendation! Read it for yourself…. AJ Lee Loves the New Threadlocker! I really like the Brush-in-Cap design you can get the right amount on the smallest to the largest bolts with ZERO waste. I wonder if Loc-Tite (or any other major brand manufacturer) tried this and found it was not a good approach? 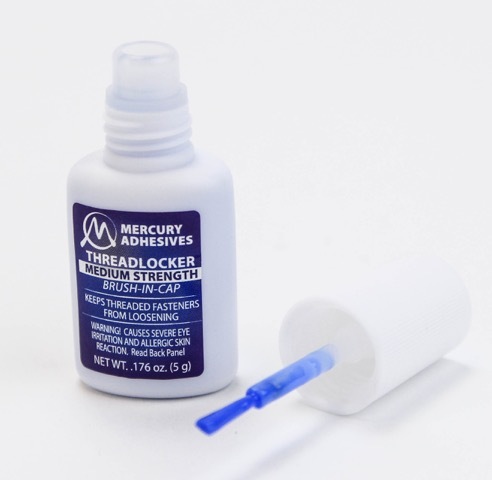 Mercury Adhesives is please to announce the world’s first Threadlocker with a brush in the cap, for a no mess application. Why is the Brush-in-Cap design so revolutionary? 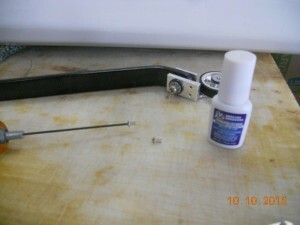 The typical Threadlocker uses an eyedropper type bottle for application. Have you ever tried to use an eyedropper to apply product to a small screw or bolt? You will either drip too much on the bolt, and it falls to your work bench; or you put a drop on your work bench, and roll the screw/bolt through it; or you put a drop on your work bench and use a toothpick to apply it to the screw/bolt’s threads. All of these solutions end up putting a drop, or two, of Threadlocker on your work bench….and who wants that? 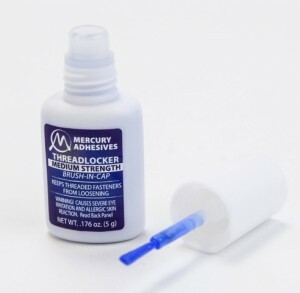 Mercury Adhesives saw the need to fix the mess of applying Threadlocker to small screws and bolts. We put our heads together and came up with the Brush-in-Cap design. Unscrew the top, pull out the brush, wipe off any excess on the side of the opening, and apply only enough Threadlocker to do the job…WITHOUT THE MESS! Helicopters and Multi-rotors (aka Drones) are 10,000 moving parts all trying to fly in different directions. RC planes using Electric motors with instantaneous torque, or RPS’s in the 10’s of thousands, want to vibrate off their mount bolts. Gas motors are even worse for vibrations that want to undo your hours of hard work. Don’t let them! 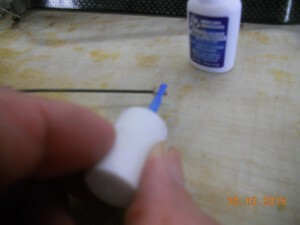 This Threadlocker is BLUE, and is of medium strength. This is, by far, the most popular “flavor” of Threadlocker, and is the first to be released. The packaging is a carded/bubble package that contains a single bottle with the new Brush-in-Cap, Threadlocker for a low $7.49 MSRP. Now available in the Dealer Store, and on Amazon.com. New Dealers, please send a note to sales@mercuryadhesives.com for a free sample.